What?!?! Didn’t Benjamin Harrison believe in American exceptionalism? I’m outraged! All sarcasm aside, this is just another example of how politics is cyclical. Harrison defeated the incumbent president, Democrat Grover Cleveland, who was a pro-business, reform minded fiscal conservative; Cleveland was an American conservative hero. 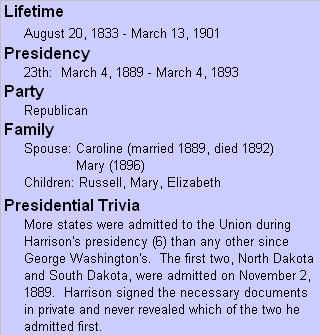 Harrison meanwhile presided over the first instance of federal spending topping $1 billion and during the very early twentieth century, his Republican party was the isolationist, anti-war party. If we live long enough, we’ll experience another shift in world view between the parties; it’s happened many times before and I don’t doubt that it will happen again.